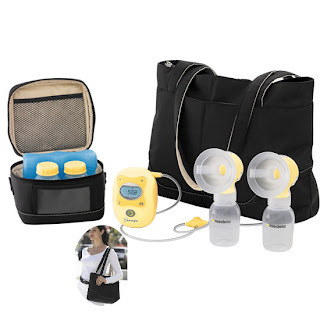 Fit Fluential Mom: The BEST Breast Pump! If you are a mom expecting her first baby or a mom that recently had her baby and are looking for the BEST all around breast pump, I have the one for you. It's the MEDELA Freestyle. Prior to purchasing my breast pump about a year and a half ago while expecting myself, I was overwhelmed with choices. None of my friends really suggested the ones they were using or were satisfied with all of the features of pumps they used. I was looking for a pump that offered a rechargeable battery, compact in size, hands free attachment, strong sucking, dual action and reliable. Some pumps had most of the features but none had all of them... until I discovered the Freestyle. I have been using the Freestyle for over a year and it has always been reliable. I use it 3-4 times a day at home and at work. I'm not sure how safe this is either but, considering I work in law enforcement and don't have much time to pump at work, I even pumped on my drive to and from work!! At one point, my pump started to act up and the sucking motion was malfunctioning. I called Medela and their customer service is excellent!! They immediately overnighted me a brand new pump, no questions asked. They sent me a pre-paid return envelope for me to return my old pump and I did not have to miss any days of pumping. Very few, if any, other companies are this willing to send out a replacement item without receiving the original first. In the case of a breast pump, we all know that it's impossible to go a day without it and Medela understands this. Visit Medela's website and take a look at this pump and all of its incredible features. It is approximately $380 at retail stores so it is not inexpensive but worth every penny. I purchased mine from ebay and was able to get it at about $280. If you save your coupons, you can also purchase it at 20% off at Babies R' Us.